WASHINGTON, D.C. -- After the deadly terrorist attacks in Paris and San Bernardino, California, Americans are now more likely to name terrorism as the top issue facing the U.S. than to name any other issue -- including those that have typically topped the list recently, such as the economy and the government. About one in six Americans, 16%, now identify terrorism as the most important U.S. problem, up from just 3% in early November. This is the highest percentage of Americans to mention terrorism in a decade, although it is still lower than the 46% measured after 9/11. Before 2001, terrorism barely registered as the most important problem facing the country. After 9/11, terrorism faded as the top problem, although mentions have spiked after major terrorist incidents. In 2004, mentions rose as high as 19% after the Madrid train bombings, and then jumped again to 17% in 2005 after the London train and bus bombings. 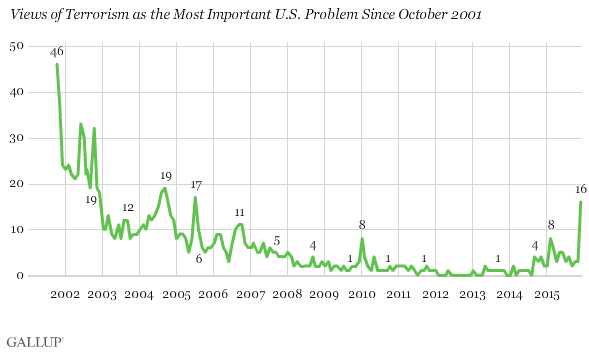 Since 2007, less than 10% of Americans -- sometimes less than 1% -- have mentioned terrorism in Gallup's monthly updates, although mentions did spike again to 8% in early 2010 after the failed "underwear bombing." In January 2015, mentions of terrorism as the most important U.S. problem increased to 8% a few weeks after the Charlie Hebdo attacks in Paris. However, they soon fell and remained between 6% and 2% until December. The most recent polling was conducted Dec. 2-6, just after the San Bernardino attacks, and a few weeks after the Paris attacks that killed at least 130 people and are considered the worst terrorist attack in Europe in 11 years. Republicans are more likely than Democrats to say terrorism is the most important problem facing the U.S. And there has been a much greater rise in Republican concern about terrorism over the last month than among members of other party groups. Currently, 24% of Republicans name terrorism as the most important problem, compared with 9% of Democrats and 15% of independents. In November, 4% of Republicans, 3% of Democrats and 2% of independents named terrorism as the top problem. In December, 9% of Americans listed the economy in general terms as the most important problem, the lowest percentage to mention the issue since the end of 2007, before the depths of the recession took hold. Mentions of the economy increased sharply in 2008 and 2009, reaching an all-time high of 58% at the end of 2008. While mentions of the economy have dropped since then, it has remained one of the most frequently named issues. 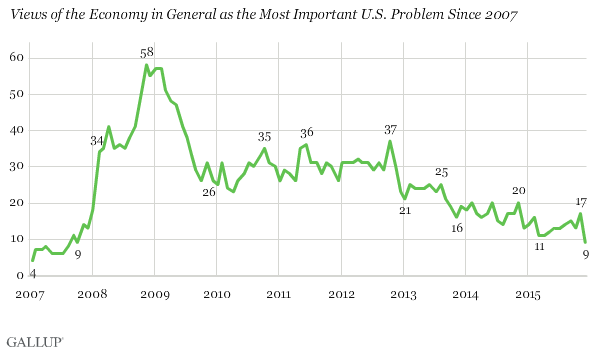 In December, 21% of Americans mentioned some aspect of the economy as the most important problem, the lowest such percentage since mid-2007 and down significantly from 39% in November. This significant drop in December does not suggest a dramatic shift in the way Americans are viewing the economy, but instead indicates that terrorism concerns have, at least temporarily, occupied more space in Americans' minds when they are asked to name the top problem facing the U.S. In December, 7% of Americans named guns or gun control as the most important U.S. problem. This is up from 3% in November, but the same as the October percentage. Before 2013, guns were rarely mentioned as the most important problem. But at the beginning of 2013, after the Sandy Hook Elementary shootings, mentions increased to 6%, though they ultimately fell once again. The issue has generally been overshadowed by problems such as the economy and the government, which historically far more Americans have named than guns. 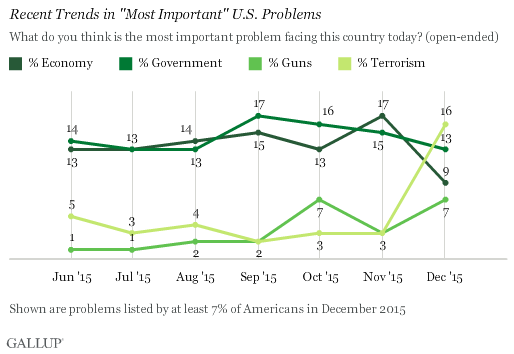 The terrorist attacks in San Bernardino and Paris have altered how Americans view the problems facing the U.S. 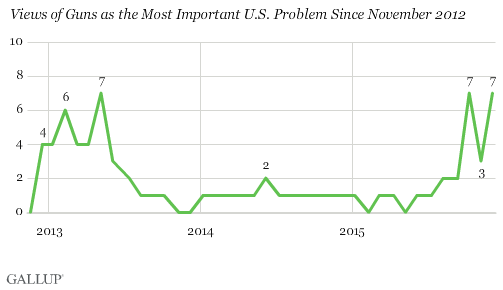 Satisfaction with the way things are going in the U.S. dropped significantly to a 13-month low in December, and Americans' trust in the government to protect them from terrorism is the lowest Gallup has measured. The data reviewed here show that terrorism has now become the single most-frequently mentioned issue when Americans are asked to name the most important problem. In the past, mentions of terrorism as the most important U.S. problem have quickly fallen after a major incident. But two major attacks in short succession, at a time when concern about terrorism was already elevated given the threat of the Islamic State, have Americans on edge. President Barack Obama himself made a rare Oval Office address shortly after the San Bernardino attacks, to discuss terrorism and how he hopes to combat it. Whether terrorism remains atop the list of Americans' concerns or recedes in the coming months likely will depend on the government's response to the terror threat as well as the occurrence, or the lack, of major attacks in the U.S. or elsewhere. Results for this Gallup poll are based on telephone interviews conducted Dec. 2-6, 2015, with a random sample of 824 adults, aged 18 and older, living in all 50 U.S. states and the District of Columbia. For results based on the total sample of national adults, the margin of sampling error is ±4 percentage points at the 95% confidence level. All reported margins of sampling error include computed design effects for weighting.